I found a cool item over at Cedar Cliff Collectibles a while ago. I had never seen one before. It's a Topps Sports Card Locker. It was a mail-away item from Topps in the late 1970's and 1980. Mail in details were printed on wax pack wrappers. It was $5.25 plus 75 cents for handling. This one came stocked with about 700 cards, mostly from 1980, but a few from 1979. I'm going to leave the cards in it, which were carefully collated by team by the previous owner. I'm also going to buy a few empty wax wrappers from 1980 to display with it. My wife and kids gave up long ago trying to buy me any sports-related items for my birthday, Christmas or other gift-giving occasion. They don't know what I already have, what I want or how much to pay. So, for Father's Day this year I was told to buy myself something. So I did. I've been watching this item for a long time and decided to take this opportunity to buy it. This is the original Twins stadium giveaway bobblehead from the year 2000. It's tough to find any of these for sale, much less an autographed one. I thought this might be my only chance to find one for quite a while. And, it's authenticated by JSA. I also have the Oliva bobblehead from this year, but haven't gotten it signed yet. I'm not sure why. I'll have to make that a priority this year. I also have an unsigned Puckett and have never seen one signed, even though he died six years after this was released. 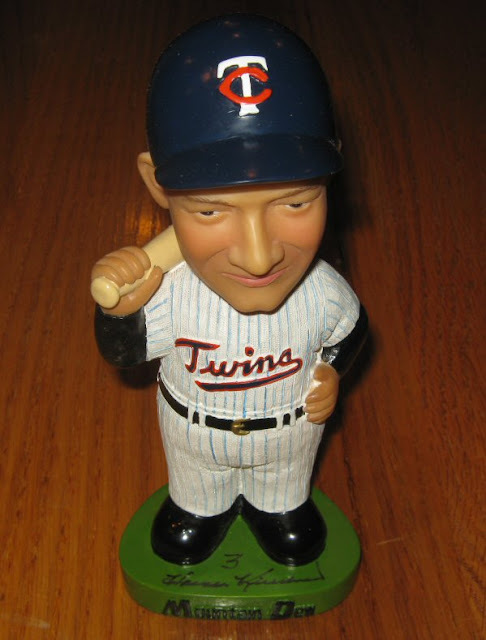 I don't yet have the Hrbek, but I'll keep my eyes out for that one too. I think this makes 56 signed bobbleheads in my collection. I was very surprised to find a return in my mailbox today. I haven't sent out a request since the end of March. 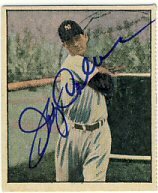 I was more surprised to see that it was a return from Jerry Coleman that I sent last October. He signed a 1952 Berk Ross for me. The rest of June is really booked with my kids' baseball so I won't be sending out anything until at least July. I'll need to spend some time going through my 1972 set to see what cards I need to buy. I think I need another project to start on. I sent a 2012 Allen & Ginter in to a paid signing at a card shop in Philly that was advertised on SCN. I got it back this week. It was odd because I also received my check back as well. I'm not sure why. 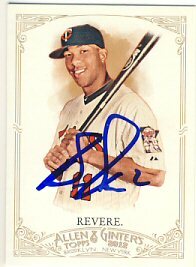 I noticed that Revere added his jersey number, which is currently 2, instead of 11 which is what he was with the Twins. I hope they didn't return my check just because of that. It's really no big deal. I sent the promoter a message via SCN but haven't heard back.